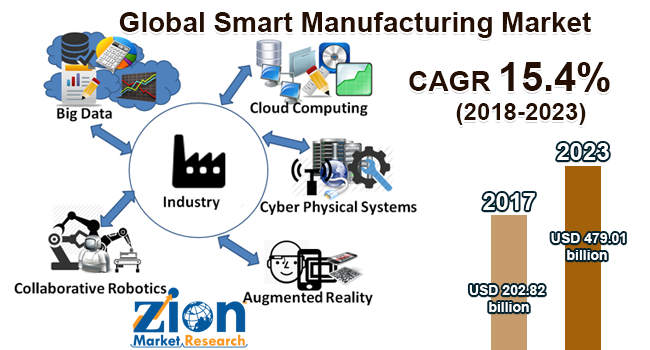 With the presence of a large pool of participants, the Global smart manufacturing market is displaying a highly competitive business landscape, finds a new research report by Zion Market Research (ZMR). Siemens AG, ABB Ltd., Emerson Electric Company, Schneider Electric, General Electric Company, Honeywell International Inc., and Mitsubishi Electric are some of the key vendors of smart manufacturing across the world. These players are focusing aggressively on innovation, as well as on including advanced technologies in their existing products. Over the coming years, they are also expected to take up partnerships and mergers and acquisitions as their key strategy for business development, states the smart manufacturing market study. In the key event that can create undulation across smart manufacturing sector, in September 2018, Zhejiang Aishida Electric Company Limited invested over USD 147 million on smart manufacturing facilities including industrial robots. Reportedly, the firm is projected to set up smart manufacturing unit featuring robots in Taizhou in Zhejiang Province along with “intelligent valley” in Shanghai. As estimated in this report, the global smart manufacturing market stood at US$ 152.3 billion in 2017. Witnessing a tremendous rise during the period from 2018 to 2023, the revenue in this smart manufacturing market is expected to reach US$ 479.01 billion by the end of the forecast period. The main components available in this smart manufacturing market are hardware, software, and services. “Mounting need for reducing costs, enhancing product quality, and large-scale production of goods & services is projected to impel the growth of smart manufacturing market in the years ahead,” says the author of this study. Apart from this, massive investments witnessed in the manufacturing sector along with the requirement for modernizing control systems will further spur the expansion of smart manufacturing market in the ensuing years. In addition to this, the rapid acceptance of smart manufacturing systems by various small & mid-sized firms across the manufacturing sector will further stretch the growth graph of smart manufacturing market towards the positive direction. High initial costs incurred during the deployment of smart manufacturing systems, however, are likely to restrict the surge of smart manufacturing market in the forthcoming years. Regionally, Asia Pacific has been leading the worldwide smart manufacturing market and is anticipated to continue on the dominant position in the years to come, states the smart manufacturing market study. Massive investments for expansion of manufacturing sector along with supportive government legislations are the main factor behind the dominance of the Asia Pacific smart manufacturing market. Huge presence of manufacturing firms across countries such as China, Japan, South Korea, Taiwan, and India adopting smart manufacturing technologies is another significant factor that is supporting the growth of this regional smart manufacturing market.